In August, retired Colonel Tom Haig and former executive director of the UW-Madison Space Science and Engineering Center (SSEC), was recognized for his early work with weather satellites and innovative leadership that helped to launch the field of satellite meteorology. At an award ceremony held in Madison, Wisconsin, Haig was joined by his family and colleagues who shared remarks about his pioneering work. Steve Pluntze, director of the Remote Sensing Directorate at Los Angeles Air Force Base, presented Haig with a plaque featuring a solar sensor from a decommissioned weather satellite built by the Defense Meteorological Satellite Program (DMSP). Haig enlisted in the Army in 1942, studying meteorology at the University of California Los Angeles. Information that we now take for granted — such as a simple weather forecast — was once classified because of the military’s desire to use tactical weather prediction over areas of interest. By the time the space race ignited with the U.S.S.R.’s launch of Sputnik in 1957, Haig (who became the first DMSP director) and his colleagues were assigned the task of installing atmospheric measuring instruments aboard a polar orbiting satellite as part of an Air Force pilot program. After an initial rocket failure, the second attempt was a success and the so-called RCA satellite went into orbit, providing dual-purpose reconnaissance satellite images while also recording Earth’s weather patterns. The recordings were later used to create forecasts for military operations. 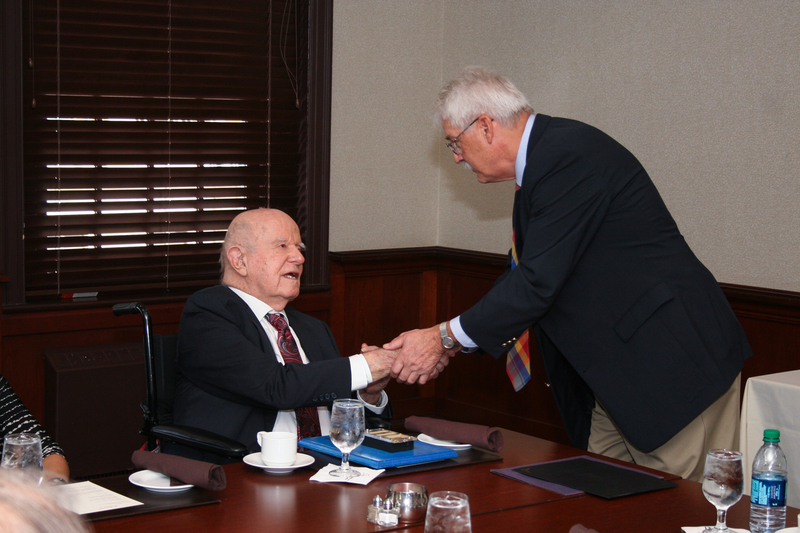 After retiring from the Air Force in 1968, Haig eventually came to the University of Wisconsin to serve as Executive Director of SSEC. He brought with him his expertise in instrument design and helped SSEC Director, Vern Suomi, to realize the full potential and benefits of using satellites to understand Earth’s atmosphere. Haig, who is now 96, addressed the group at the award ceremony and shared stories about the unique challenges he and his team faced in designing and launching the satellite, and then locating it after it successfully entered orbit. “Once we found it, we plotted its orbit and we knew we were in business,” said Haig. Read more about the history of the military polar orbiting meteorological satellite program.